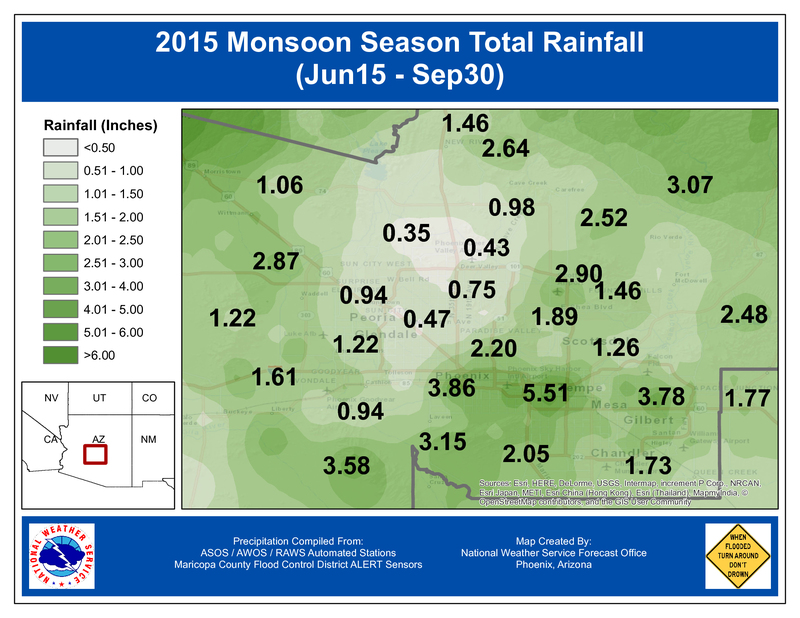 Dewpoint Average must be at 55�F or higher for 3 days in a row to offically start the Monsoon Season!! The 2015 North American Monsoon season will be characterized as warmer than average for the state of Arizona and Southeast California. Like most monsoon seasons, rainfall amounts varied widely between cities, and even from neighborhood to neighborhood. 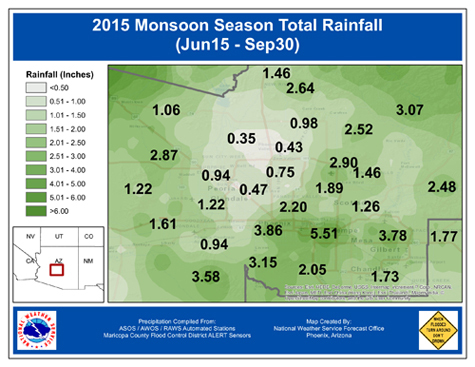 However, when averaged across the entire region, the 2015 North American monsoon produced around average rainfall amounts. 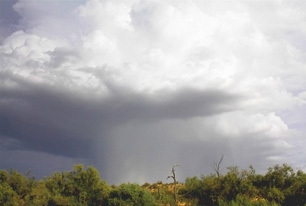 This monsoon season began quite actively across the southeast parts of Arizona with several thunderstorm complexes throughout the 2nd half of June. 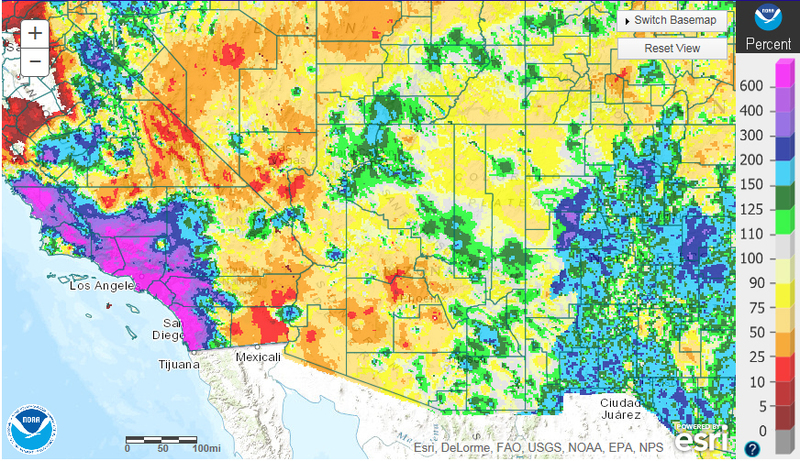 While rainfall was not plentiful through central Arizona, numerous dust storms made their way north into the communities of Casa Grande, Gila Bend, and Phoenix. While Tucson and SE Arizona experienced repeated thunderstorm days in the beginning of July, points to the north and west had to wait until the middle of the month before activity really increased. Thanks to the remnant moisture from a decaying Tropical Storm (Delores), widespread strong thunderstorms and heavy rainfall developed on July 18th and produced damage and flooding in the town of Wickenburg. This was just the beginning of a period of active and destructive weather across the region. On the very next day, July 19th, strong storms erupted over Southeast California producing large hail, strong damaging winds, and incredible flooding rainfall. One individual storm over Eastern Riverside County dumped an estimated 5 inches of rain in a very short time period along I-10 near Desert Center. This lead to extreme flash flooding in the area of Tex Wash which completely washed out one side of the Interstate, shutting down a major transportation corridor for over a week. two rounds of storms on August 11th. Periodic thunderstorms were common through the 2nd half of August culminating in another round of damaging winds and flooding on August 31st. Central Arizona wasn't the only location susceptible to severe storms this monsoon season, with blowing dust, damaging winds, and flooding hitting the Yuma and Somerton areas on September 8th. Monsoon Season 2015 rainfall across both the Phoenix metropolitan area and Maricopa County as a whole varied widely with some local communities receiving over double the average monsoon season totals, while others received well less than a quarter of normal. The biggest "winner" was the city of Wickenburg with areas around town getting over 7 inches of rain, albeit at the expense of significant flooding. 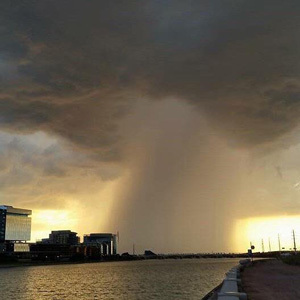 Within the Phoenix metro area, the corridor from downtown Phoenix through Sky Harbor Airport and Arizona State University saw several good rain producing thunderstorms. 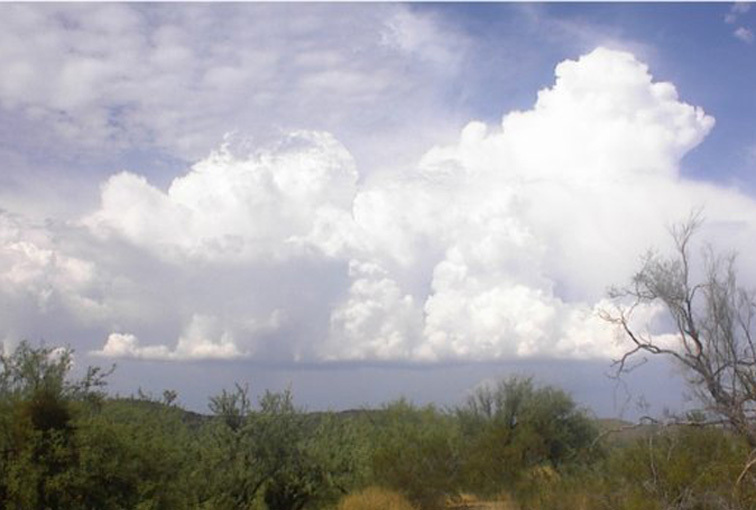 Meanwhile, North Phoenix and the Deer Valley area experienced very few thunderstorms and only paltry amounts of rainfall. This includes Pepperridge North Valley which only saw 1.15 inches of rain (2.07 inches) below Normal or (36% of Normal). This leaves 2015 ranked as the second driest ever at Pepper Ridge North Valley. Only 2009 season was drier at only 0.69 inches. The picture to the right shows the isolated nature of the storms this summer. This picture is from September 22nd showing a isolated storm over downtown as viewed from Tempe Town lake looking west. 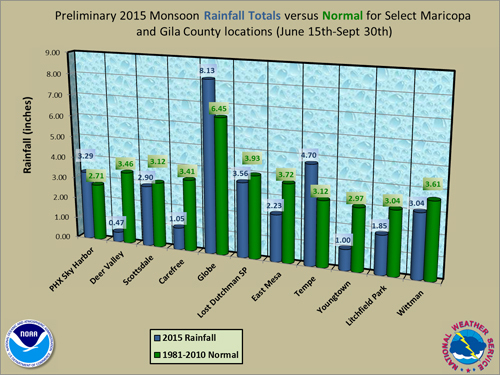 The data contained in the following graphs below is courtesy of Maricopa County Flood Control District. 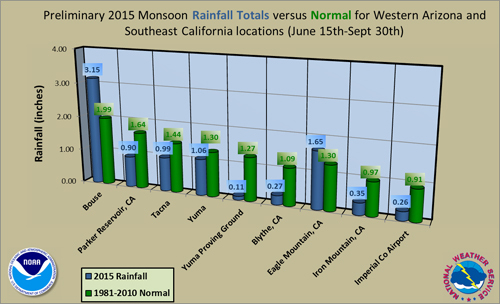 This is preliminary data and some gauge reports may contain missing data for the entire monsoon period. 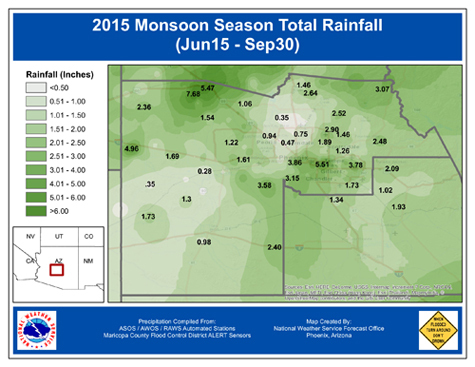 Maricopa County was not the only area to experience spotty, highly varying amounts of rain this monsoon season. 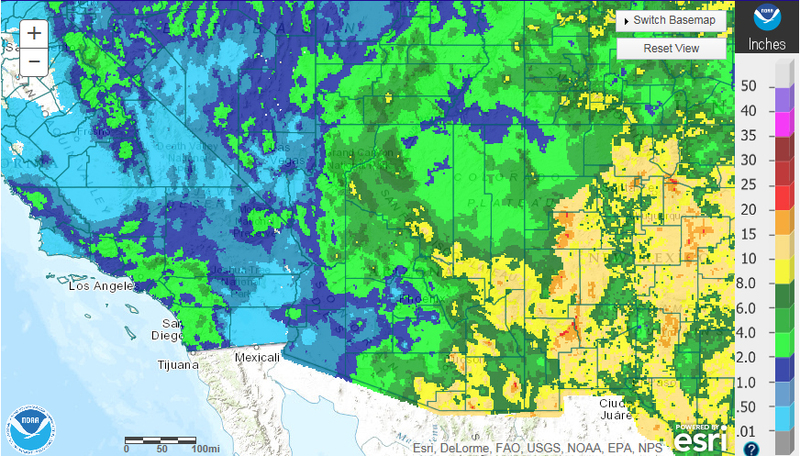 Much of southeast Arizona around the Tucson area saw more than double the monsoon average, as did numerous communities along the Mogollon Rim and far northern Arizona. But, given the typical isolated nature of storms during monsoon season, neighboring communities not far away within the same county received much less. This is very normal for the monsoon season - we've just been spoiled the past couple years where large swaths of the state received beneficial rainfall. A different look at several observation stations around the region with respect to observed rainfall and normal monsoon rainfall can be seen in the bar graphs below. The temperature fell from 98�F to 77�F during the same period with winds gusting to 32mph! !